We present to you an expansion to Marvel: Legendary,NOT related to the recent Venom movie. 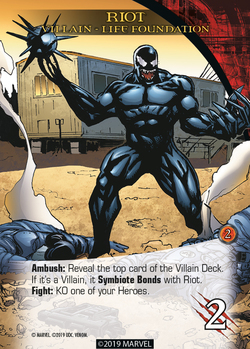 Features 100 cards, playable version of Venom, Venom Rocket, and Carnage among others. A special version of the mastermind Thanos, Poison Thanos. 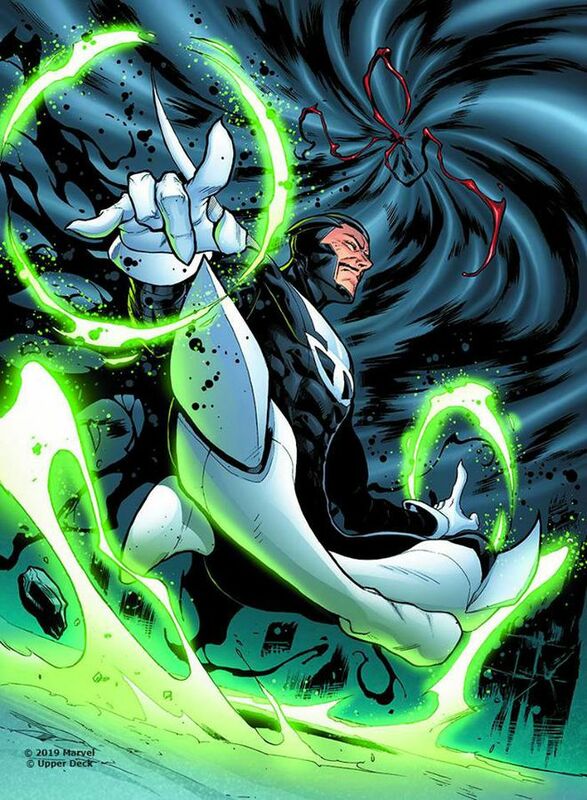 2 masterminds, one of them Poison Thanos and Hybrid. Both with EPIC versions. Poison Thanos, Epic Version. Needless to say this one will be hard to beat. But perhaps; Hulk Smash? Return of the Excessive Violence keyword. What this means is, "If you have 8 cards in your vicotry pile, <do something>. Indigestion in this case would be; If you don't have 8 cards in your victory pile <do something else>. 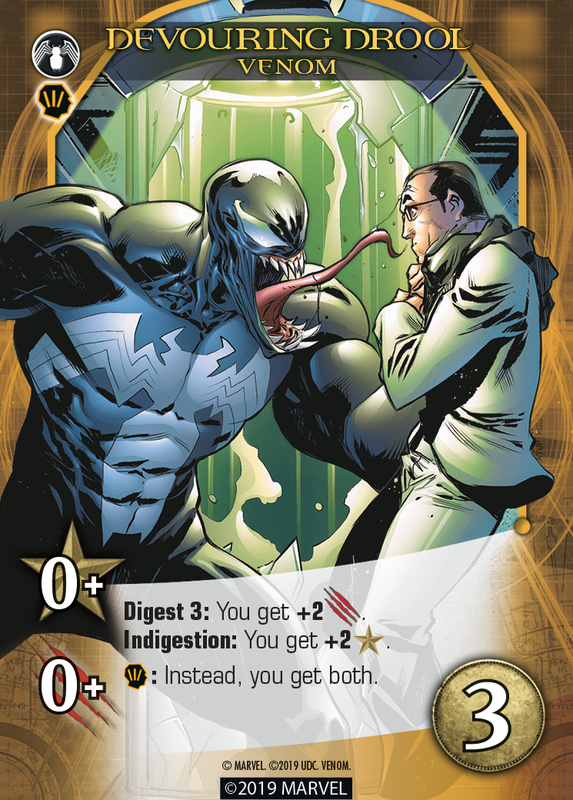 This is supposed to be a metaphor for the Symbiotes hunger, and if there is plenty of food (In your victory pile), the Symbiote is happy, if not, he/she gets Indigestion, which may lead to bad stuff.. OR good depening on how you look at it. 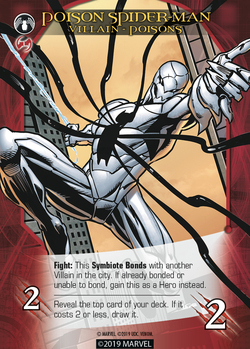 The Poison Bad guys get Symbiotic Bounds, which enables them to combine attack power with another villian. Symbiotic Bounds mechanic. In this case the villian get 7 power. Basicly you probably don't want these to combine with the Bribe villians.. 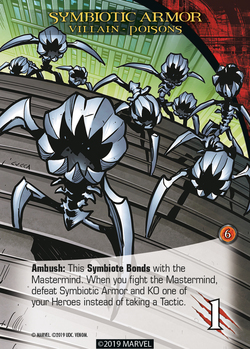 This means stack this card onto the specified villain, combining them into a single villain with combined attack. To fight a combined villain, you must spend the total attack of both villain cards combined. Then put either one of the villain cards from the combined villain into your victory pile and do that card’s fight effect. 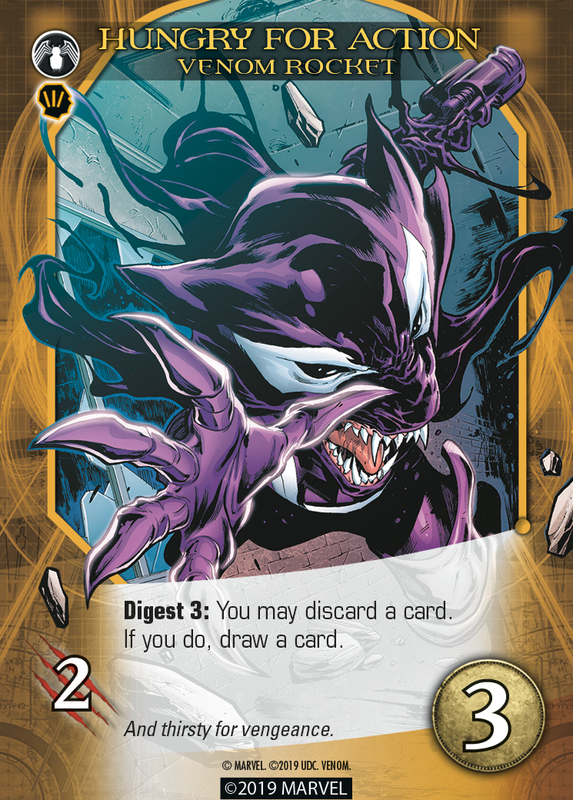 The other card from the combined villain stays in that city space, and you don’t do its fight effect. Some new artwork gives us some clues on new heroes/villians. These two looks like Dr Strange and Rocket Racoon, in venomized versions. These are now confirmed. 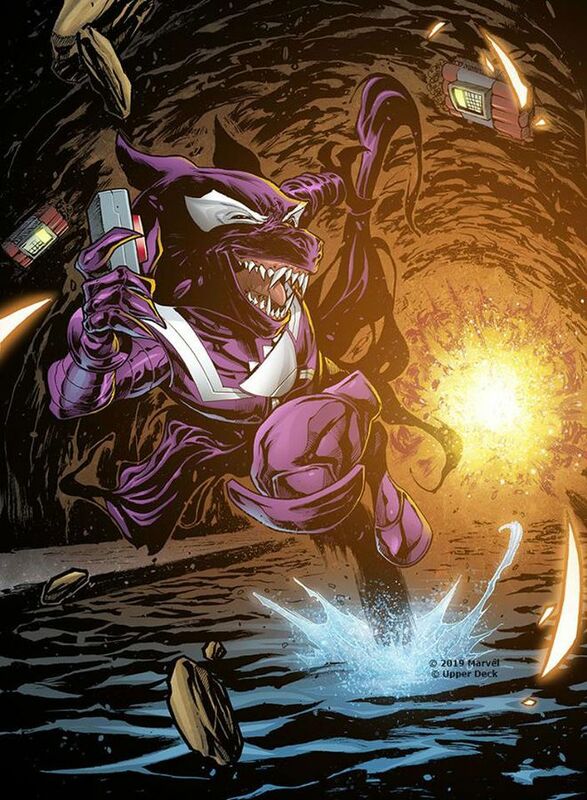 Venomized Rocket Racoon, this is confirmed. 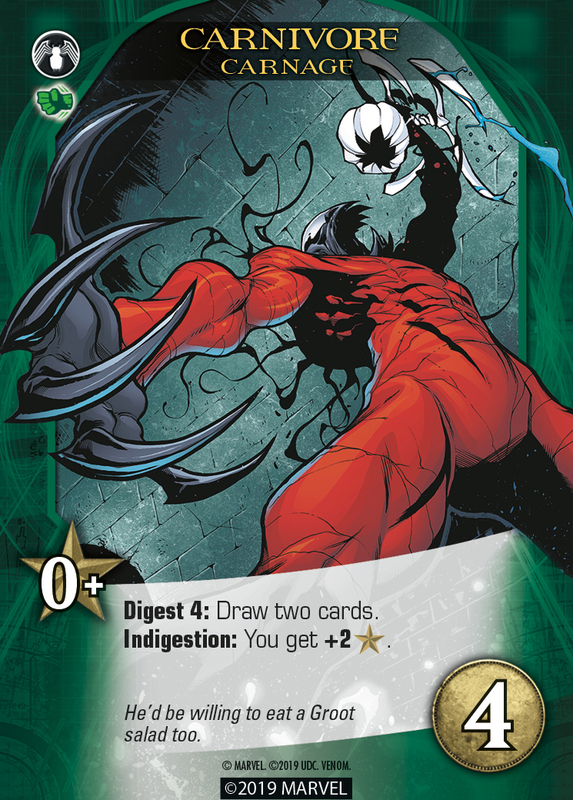 Venoms 8 cost card looks mighty good combined with other Venomizers.. Excessive Violence comes back in this expansion.This one lets you eat your not so useful teammates. 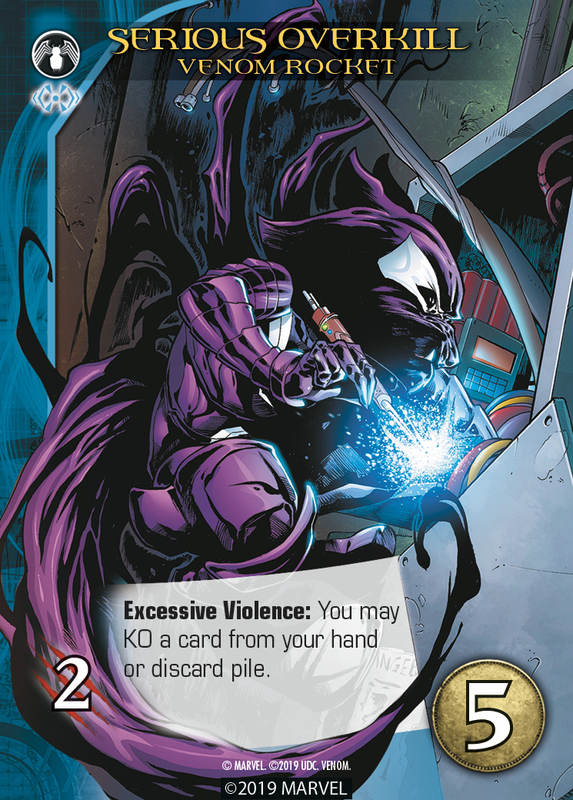 Another Excessive Violence card. Venom Rocket likes his explosives.. Collateral damage is to be expected. Digest/Indigestion mechanic. 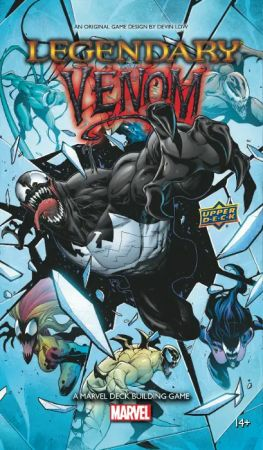 A fully energized Venom is a force to be reckoned with. 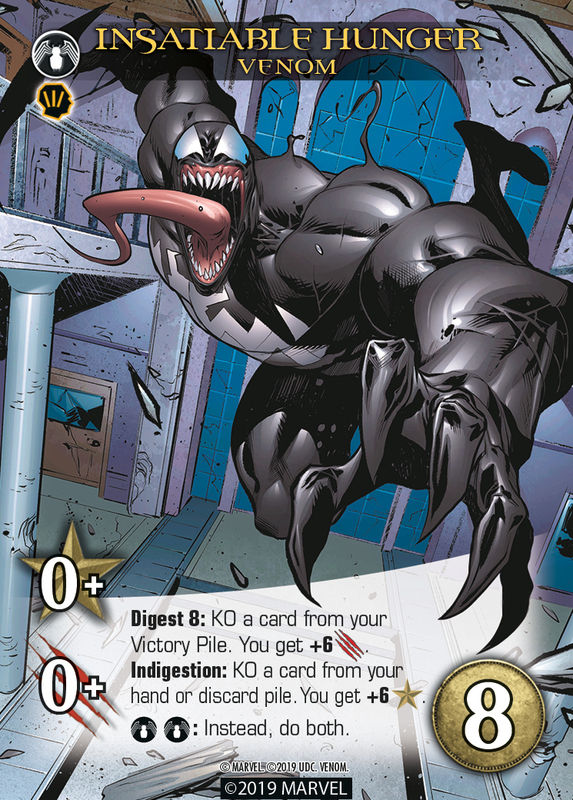 A Hungry Venom..? Also, notice the combo, get both power and strength.. Nice! This expansion should be out in the stores by now, and you can pick it right here! This one is the very first expansion you should get. Introduces a ton of new mechanics, heroes (Cable, Blade, Elektra, Punisher and so on.) and villians, like Apocalypse and Kingpin. Unfortunatly, it's out of print at the moment, and if you come across it somehwere, get it! This one takes place on "Planet Hulk", obviously starring more Hulk characters, which is always good, and villians like The Red King and The Sentry. Also introduces a couple of new mechanics. The secret war expansions or thematicly not for everybody, but they sure brings ALOT of cool characters, villians, schemes, bystanders, masterminds etc to the mix. Who doens't want to wreak havoc with The Captain and the Devil or Black Panther? Who doesn't want to defeat the Spider Queen? We challenge you to defeat Zombie Green Goblin with a decent scheme. Good luck. Considered to be one of the weakest expansions, but we love spidey, so we love this expansion. 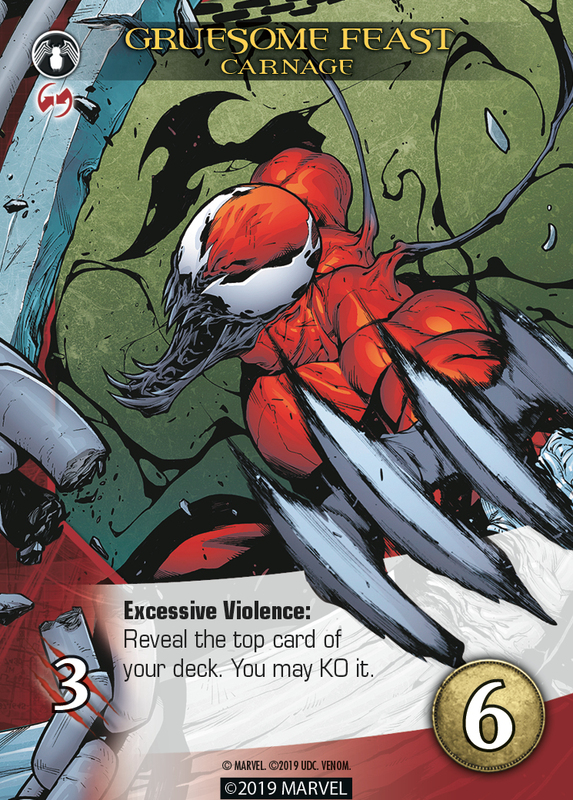 Also, you'll get a Carnage mastermind, which is hella-nasty.